It seemed like there was always a disproportionately large amount of tossed salad in comparison to kid-friendly favorites. From an early age, I learned that no matter how much milk you add, you just can't stretch a box of Kraft mac & cheese to satisfactorily feed eight people. Likewise, a 2.5 serving carton of Stouffer's spinach souffle yields only about a tablespoon of fluffy green goodness per plate in families as big as ours. Needless to say, these items were always gobbled up first. Depending upon how hungry or finicky you were, the rest of the stuff on your plate was either a blessing or a curse. I joined Dad's Clean Plate Club in infancy! In our house, my father considered it a sin to waste food. Aside from hearing his stories about near-starvation during his series of imprisonments during WWII, we were constantly urged to "think about all of the poor, starving children in India." To motivate us to eat everything on our plates, he devised the Clean Plate Club. In order to obtain membership in this exclusive club, we had to be able to hold our plates upside-down over our heads without any morsels of food falling off. Sadly, some of my siblings never achieved the conditions necessary for induction into the CPC. For hours after dinner ended, he or she could be found still sitting at the table, scowling with chin on fists at the stone-cold mound of whatever it was they'd refused to eat. Ironically, these siblings were later rewarded with offspring who were ten times pickier than they'd ever dreamed of being. Just like my dad, I hate seeing good food go to waste. I've always enjoyed cooking, and once I began shopping and planning meals for my own family, I developed a real flair for repurposing leftovers. The unique nature of the ingredients in these flash-in-the-pan dishes meant they could never be exactly replicated. But, they always left the men in my life begging for more. Because I rarely follow recipes, I've amassed a repertoire of variations and permutations on these family favorites that closely approximate the original masterpiece of frugality. I've gotten so good at improvising that within moments of perusing my fridge to see what I've got on hand, I can visualize a casserole or one-pot meal of some sort, without having to grocery shop. The internet has made this process even easier. The other day, I googled "tofu, kale, mushroom, butternut squash" and found the most delicious recipe for a savory strudel. Luckily, I happened to have a box of Pepperidge Farm puff pastry in my freezer, so I had everything I needed to make this elegant-looking but deceptively easy, super-tasty dish. Last night, my son Rory came over for dinner. I had a little time to kill, and thought I'd make something special for dessert. I came across a can of chestnut puree that I've had for quite some time, purchased on a whim from a gourmet food store. I've never cooked with it before, so I googled "baking with chestnut puree." Up popped a French recipe for a crustless tart, calling only for chestnut puree, eggs, and butter. Yum! What's not to love about a "rich, faintly sweet chestnut cloud"? The only problem was, the recipe specified 500 grams of puree, and my can contained only 435 grams. In baking, measurements usually need to be precise. I wanted to substitute an additional 65 grams of something, and one more Google search revealed pureed sweet potato as the perfect replacement. 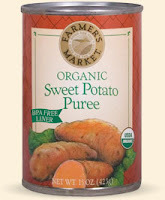 Since I always have a couple of cans of sweet potato or pumpkin puree in my pantry, this was a no-brainer. Sixty-five grams of sweet potato amounts to about two tablespoons, so this meant I'd need to figure out something to do with the rest of the can. In the meantime, I covered it up and put it in the fridge. The tart ended up being delicious, like a velvety flourless cake, perfect with a glass of Chilean cabernet. Who needs a bakery when you've got pans like these? Pleased to immediately find a baked sweet potato doughnut recipe online, one which used whole wheat pastry flour, lots of fragrant spices, and very little added sugar, I mentally tweaked it to make it even more healthy by substituting coconut oil for the butter. The batter came together quickly, and into the pans it went. The kitchen smelled fabulous. I still had a couple of tablespoons of sweet potato left, so I made a gingered powdered sugar glaze, using the remaining puree in place of the usual milk or cream. Terrific Kris. Loved the pictures & those memories. That clean plate club! How good's that trick? I often wonder how those men & women ever got over that war stuff. What an amazing lot! I must say I always have an admiration for large families that can pull that special kinship off. Must have been tough on the finance side. But to be part of a large, close-knit family must be pretty cool. Fortunately, Ian, I was always a good eater and member of the Clean Plate Club, and was blessed with twins with adventurous appetites. The memories of my family's meals are priceless. Of course, none of us kids had any idea of the innovation and budgeting it took for Mom to pull those meals off every night! I've always loved family, but ours have aways been small as we did a lot of travelling, so the wider clan always tended to be overseas. Kris, you're a marvel. Hard to imagine anyone enjoying doing all that cooking. I find making toast an ordeal. 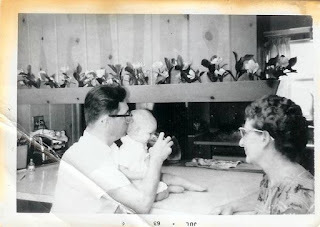 Love the family photos-those old black and whites have such character. Growing up, I never ate supper with my family. I was always outside somewhere playing with friends. My mother would make me a separate meal whenever I got home. I'm still the same way, and my wife hates it. Because, like your family, hers always ate dinner together and made a big ritual of it. Toast certainly can become an ordeal, especially when it gets stuck inside the toaster. My husband isn't much of a cook, but he's a ready and willing helper in the kitchen, and I enjoy chatting while we're preparing a meal together. If dinner was left up to him, everything would be cold and raw. Those are some great pictures you used for this story of memories, thoughts, and ideas. I grew up in ahouse where wasting food was like a slap in the face to my parents who who worked so very hard for so very little. That, among other things, carries thru as I raise my family. Meals are "sacred" to me. I have killed most of we eat, culling it from nature to feed my family. Therefore I don't like to waste any of that, so being a master of leftover disguise has sort of become an art with us. The story you shared here was great, growing up Catholic I can relate to the speedy prayer, said to fast in my house resulted in my dad repeatin it in a long drawn out version while we all quietly watched the steam stop rising from our plates. 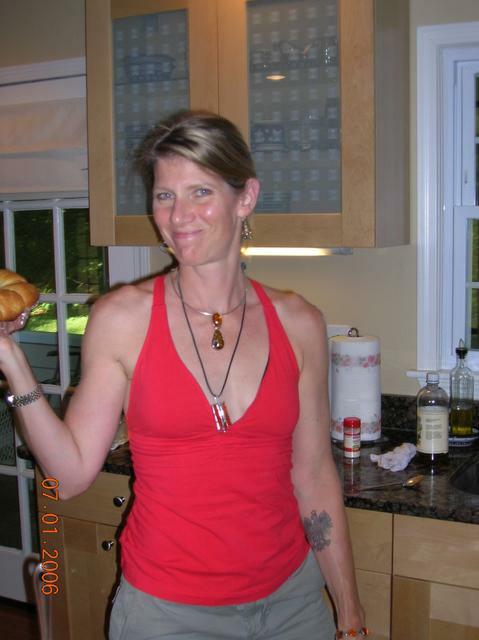 I never understood thanking anyone else than my own mother who was the preparer of our meals. As I got older, as I assume many kids do, I miss the budget meals made with love to stretch it out to feed all of us. Great story and great pictures Kris! Kris, you brought back wonderful memories of large family dinners-- Sundays at Grandma's house after church. As well as some less wonderful memories...lol. As a picky eater, there were quite a few times I spent hours at the table. I couldn't understand why they wouldn't let me just scrape the unwanted contents of my plate into a bag and send it to those starving kids in India. It was a win-win as far as I could tell. And yes, I was "blessed" with a picky eater of my own! Those donuts look fabulous. I wish I had one right now to go with my coffee as I enjoy another wonderful story from you! Gina, we'd ask our parents the same thing about scraping our plates. As a kid, it seemed like a reasonable approach to ending starvation. Jade, your heart-shaped cherry shortbread biscuits sound amazing! 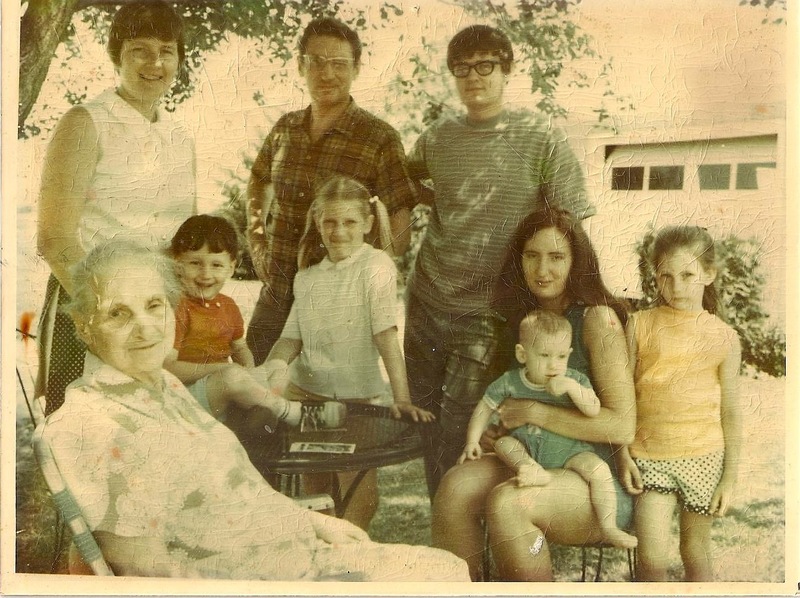 Yes, my grandmother was a character, and the fact that she didn't speak English only added to her charm. Kris, I love your “Master of Leftovers” photo and your family photos (so cute in those pigtails!). How wonderful that you have those memories! I smiled when I envisioned your grandmother secretly dropping her Polish meatball, by accident of course, onto the floor for your dog. The speed version of the dinner blessing (which I know from having been raised Catholic) had me laughing out loud! My father grew up in the Depression and served in the war, and he considered it a sin to waste food too. We were also told to think about the “poor starving children.” The Clean Plate Club, what an excellent way to get kids to finish everything on their plates. Smart dad you had! Madilyn, I had to sit here, repeating the dinner blessing just the way we used to say it to get it phonetically correct. I am constantly delighted by the recipes and food combination ideas I find on the internet. The doughnuts were a home run. 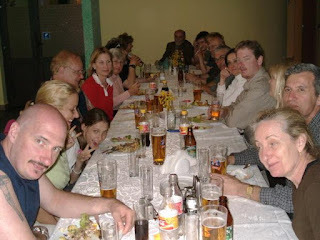 Helena, It's sad how joint families -and joint dinners- have passed into folklore even in countries like India. Traditionally, wasting food has been unforgivable in a major chunk of the populace; it's true that many go to bed with 'ash in their stomach' out here. So, even if I was a finicky eater as a child, I did justice to most that was served. Sadly, I cannot vouch the same for the current generation that doesn't care for joint meals even in nuclear families. Left over magicians are unheard of in the fast food era. I loved your picturesque journey down the memory lane. It was delicious and heart-warming.